In a Class B Central Business District market in downtown Baltimore where a decade of “flight-to-quality” of tenants has left large blocks of vacancy, nearly 65,000 square feet has been occupied over the past year by new tenants at One North Charles Street. This leasing streak represents more than a 20% increase in occupancy, which is greater than the loss experienced with the recent departure of a long-term tenant whose contract had ended. The recent activity has ranged from 1,200 square feet to 27,000 square feet with terms anywhere from one year to over 10 years. “The uptick was the result of the entire team – leasing, management, and ownership being nimble, creative, and willing to look long-term when transacting deals,” stated MacKenzie Senior Vice President, Terri Harrington. “New building ownership really stepped up and provided the capital and flexibility required to lease the vacancies. Once ownership understood the market conditions and how to navigate them, they got aggressive and were able to make things happen.” Harrington has represented the building for over a decade. 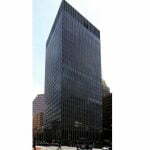 One North Charles, known over the years as the Blaustein Building, is a landmark downtown Baltimore office tower originally built in 1963 by the founder of Amoco Oil. The property, at the corner of Charles and Fayette Streets, was one of downtown’s first modern high-rise office towers and a key component of the Central Business District’s renaissance. Consisting of 290,619 square feet, the 25-story office tower is currently owned by Northern Capital of New England. For more information on One North Charles, please visit www.mackenziecommercial.com. For leasing inquiries contact Terri Harrington at tharrington@mackenziecommercial.com or 443.573.3213.